Prepare a cookie sheet and line with foil. In a medium size sauce pan melt the chocolate over low heat stirring constantly Remove from heat and stir in butter until melted. Finally stir in the whipping cream. Allow to cool slightly and refrigerate chocolate for about 20 minutes checking frequently and giving the mixture a stir. The chocolate should be able to hold shape. Shape about 1 teaspoon of the mixture into balls and place onto cookie sheet. Place into freezer and freeze for 30 minutes. Meanwhile, heat the shortening and white chocolate chips over low heat stirring constantly until chocolate has melted. 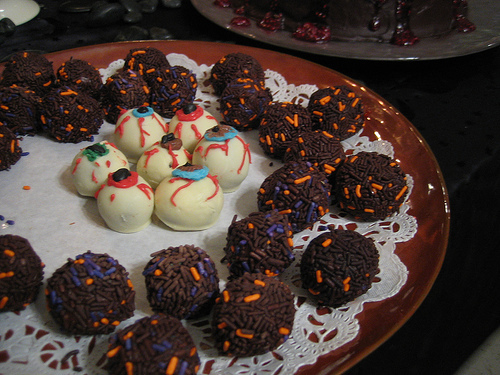 Remove the truffles from the freezer and dip the balls into the melted chocolate one at a time. Place back onto cookie sheet and allow the chocolate to set. If you are decorating with the other optional toppings you will want to roll or sprinkle the truffle with your desired toppings. Decorate the eyeballs with the red gel frosting and the mini M & M's or chocolate decor frosting for the center of the eyeball.